Injury or overuse: If you've been injured in an auto, work, or recreational accident, get help at once. Since injury can affect muscles, ligaments, bones or discs around the spine, it's important that you get a proper diagnosis and treatment plan (if required) before the dominos begin to fall. Herniated, bulging, or compressed discs: Spinal discs are round, flat discs of tissue that cushion the bones (vertebrae) of the spine. If discs get damaged from injury, disease or even the normal process of aging, they can be compressed, bulged or even rupture. 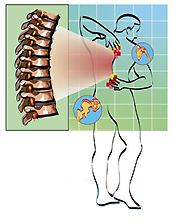 This can interfere with nerve function and create pain, numbness or weakness in the back or extremities. Osteoarthritis: This refers to degeneration of the small facet joints of the spine that can cause further misalignment and pain. Typically a result of the natural aging process. Spinal stenosis: Another condition that is often a process of aging whereby the spinal canal narrows, squeezing or irritating nerves. This condition can be the result of degeneration and/or excessive bone growth or thickening of cartilage and other tissues in the canal. 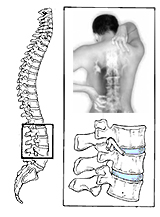 Left untreated, spinal stenosis can lead to serious nerve damage or even paralysis. Emotional and Physical Stress: Stress in life can cause muscle tension and set off a vicious cycle of pain. As muscles contract, fatigue can cause muscle aches or pain. Pain and discomfort can lead to sleeplessness with its associated problems such as irritability, depression, and reduced immune function. And so the problems perpetuate.